Though I count The Haunting Of Alaizabel Cray and Poison as ‘crossover’ books in that they would be just as happy in the adult market as on the YA shelves, this was the first of my books to be published on Gollancz and hence officially in the adult market. That this ever got written at all is in equal parts due to my agent’s wise insight and my own insane persistence in getting the bloody thing finished. Ever since I had started writing I had been alternating between writing books for Scholastic and making abortive attempts at adult novels that inevitably got out of control and collapsed. I think I had about three half-novels’ practice over the years between Catchman and Alaizabel before I began to write what was to become Weavers, none of which ever got completed. After Alaizabel I determined to stop mucking around and write an adult fantasy book, and I was going to finish it even if it meant I ended up back in the student-level poverty that I had just about got out of by that point. The Cold Road was the result. I won’t tell you the plot, since I may use it again one day and I thought it was pretty good. 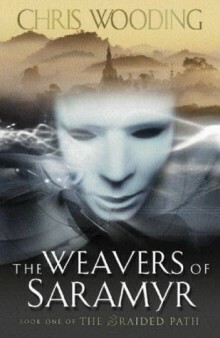 Suffice to say that towards the end of the book, the protagonists came across a land where the Weavers lived, a horribly corrupt race who used masks to gain supernatural powers. But the masks ate into their sanity and befouled their bodies every time they used them, and were narcotic in effect, trapping them in a cycle of addiction. Power at a terrible price. I sent it to my agent, unbelievably relieved at having finally completed it (and it was easily twice the length of my previous efforts). She didn’t like it. I was mildly crushed. But she did like the Weavers. ‘Couldn’t you get more of them in?’ she suggested. Trouble was, after I got over my initial reluctance to change anything about the book, I agreed with her. The Weavers were the best thing about it. Unfortunately I’d constructed the story in such a way that it was impossible to bring them in any earlier without rebuilding it from scratch. So I did. I tossed the original concept and rewrote the whole story with the Weavers as a starting point. Writing-wise, I think that’s the hardest thing I’ve ever done, and probably also the smartest. I also rewrote the world that the story was set in. Whereas The Cold Road was a little more trad-fantasy, The Weavers Of Saramyr needed something different. The masks of the Weavers put me in the mind of the masks in Japanese Noh theatre, and everything went from there. Saramyr gained an oriental theme, based on a blend of ancient Japan, China, Persia and Renaissance Italy and not resembling any of them very much in the end. I wanted the characters to have rudimentary use of gunpowder to offset the traditional swordfighting and make the conflicts more interesting; rifles are commonplace but unreliable in Saramyr, an alternative to hand-to-hand weaponry but not an effective replacement. For the background, I used elements of Shinto mythology blended with traditional polytheism to put the structures of belief in place, and the story (most of which had already been set up in the process of writing The Cold Road) sewed itself together again in an entirely new skin. I believe it came out many times better for it.